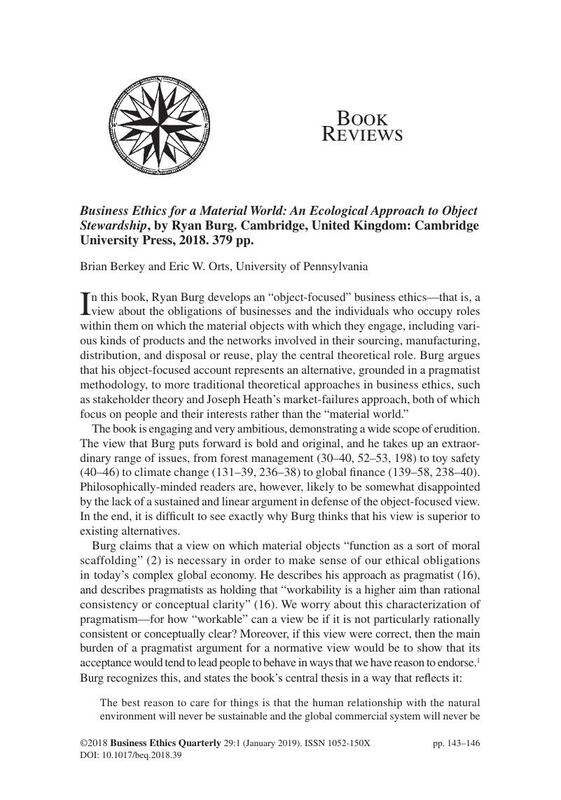 Business Ethics for a Material World: An Ecological Approach to Object Stewardship, by Ryan Burg. Cambridge, United Kingdom: Cambridge University Press, 2018. 379 pp. 1. Notice in this connection that even on Burg’s account pragmatists cannot avoid engaging at least some fundamental questions of value in a manner characteristic of non-pragmatist philosophical inquiry. We cannot determine what kinds of behavior we have reason to endorse, or, in Burg’s terms, what kinds of behavior a “workable” theory would encourage, by asking which answer to that question is the most workable.